The lemon drop cocktail is a very sweet and sour cocktail. It became popular around the 70′s in California. 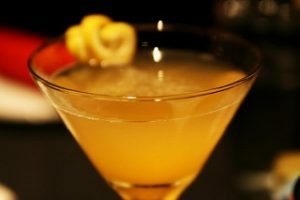 Today, the lemon drop cocktail or martini is one of western Canada and USA‘s favourite drinks. The drink was created at a now long passed bar once called Henry Africa’s in San Francisco USA. The creator of this cocktail was a bartender by the name of Norman Jay Hobday, who wasn’t just the primary mixologist but also the founder and proprietor of Henry Africa’s. In 1969, Norm fashioned the cocktail after the sour lemon flavoured candies… also known as Lemon Drops. This is a great cocktail because its hard to taste the alcohol. It also means this cocktail can be a little dangerous due to its’ drinkability. Add Vodka, Orange Liqueur and 1tsp of sugar into a cocktail shaker half filled with ice. Of course, if your guest requests more sugar, you can add more to taste. In our bartending classes, we teach this cocktail a little differently. Back in Norm’s day there weren’t as many flavoured vodkas kicking around. Today the lemon drop we teach a simplified version which is designed for speed. Lemon flavoured vodka is used and the spirit and no triple sec. Simple syrup allows the addition of dissolved sweetness. The rim of a chilled glass is moistened with a lemon wedge, then sugar coated to create a sweet frosting. The cocktail is then poured in the glass and garnished with the lemon twist or wedge.